Lawffice Space - Employment Law Blog by Philip Miles: Today is Constitution Day! Ah yes, today is Constitution Day! We celebrate on the date the Constitutional Convention signed the document back in 1787. Of course, it would take some time and fierce debate before it was ratified. I recently read a good book on the ratification debates: Pauline Maier's Ratification The People Debate the Constitution, 1787-1788. If you're interested in the debates, check it out. 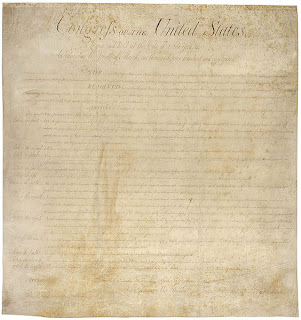 I think people, on average, underestimate how close "we the people" came to rejecting this thing. I guess I should bust out an employment law tie-in, since this is an employment law blog. The Constitution provides numerous protections for public employees, including due process, equal protection, free speech, free exercise, and more. For a good example of how the Constitution impacts employment laws in other contexts, check out the Supreme Court's 2012 opinion in Hosanna-Tabor v. EEOC. The Court analyzed some First Amendment issues, including the ministerial exception to federal employment laws. Finally, what would Constitution day be without the Constitution!? Read it here.